Back in January, I gave you all a sneak peak of my big Home Office Revamp. I promised at the time that I was working diligently on the project and would be sharing soon. Well, then life happened and even though I did continue to work on the room, I never bothered to come back and share the final results with everyone. Last Friday night, on a whim, I shared a photo on Instagram of the room's progress and much to my surprise, everyone loved it. So, I thought that I'd try to take a few more decent photos and share the space officially on the blog. So without further adieu, here's our guest bedroom/office. 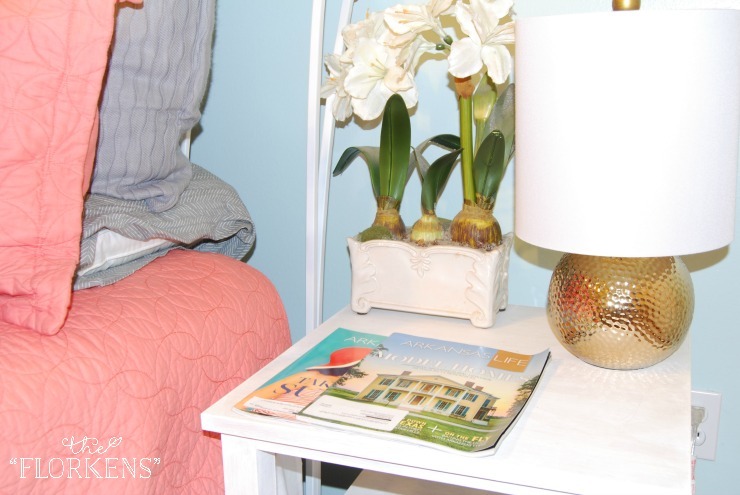 A LOT of work went into this pretty little space, including painting the desk and both side tables. I also put together that nifty little CORKboard you see hanging above the desk. I also placed the gold foil decals from Urbanwalls up all by myself and was pretty proud of how they turned out. 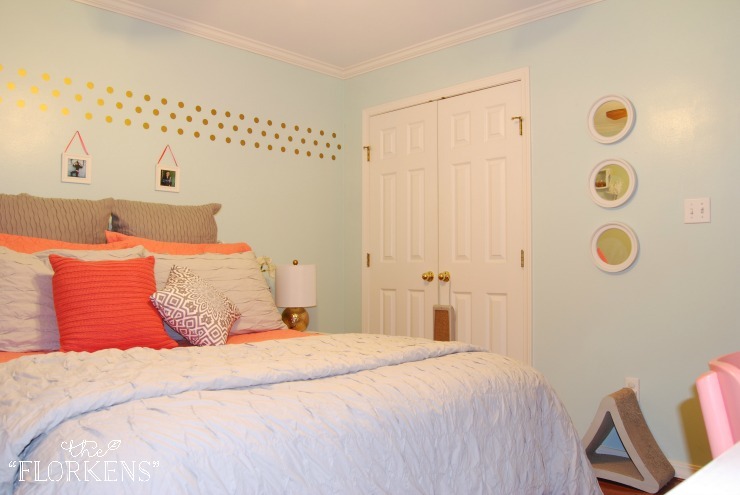 The trend seems to be to do an entire wall of gold dots, but I found that I really liked the idea of just doing a simple border along one wall. So that's our guest bedroom/office in a nutshell. 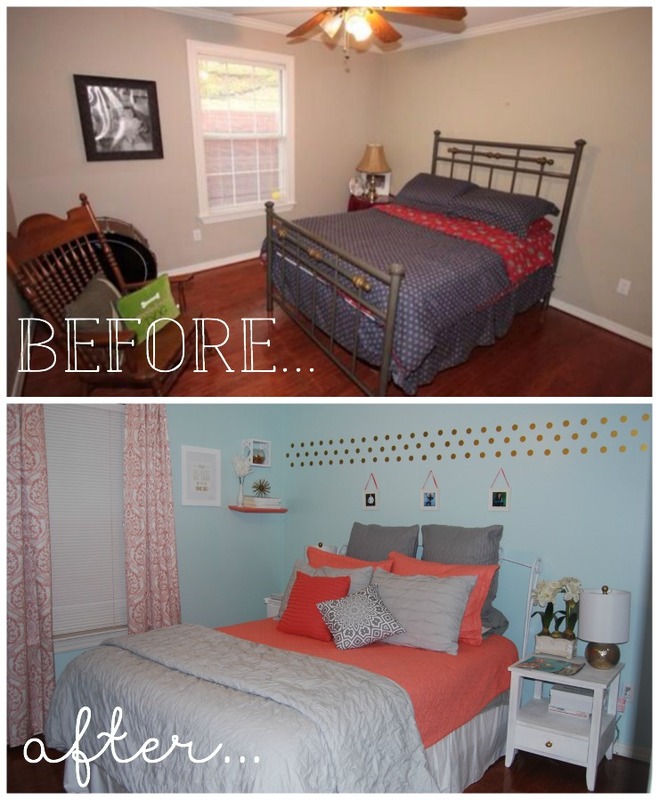 In case you are wondering what this room looked like before I got my grubby hands on it, check out the before and after below. The before is the listing photo of the room from when we bought the house back in February of 2014. So, what do you guys think? I'm in love with this space and now can't wait to really dive into fixing up that other room in the house... you know, the nursery! 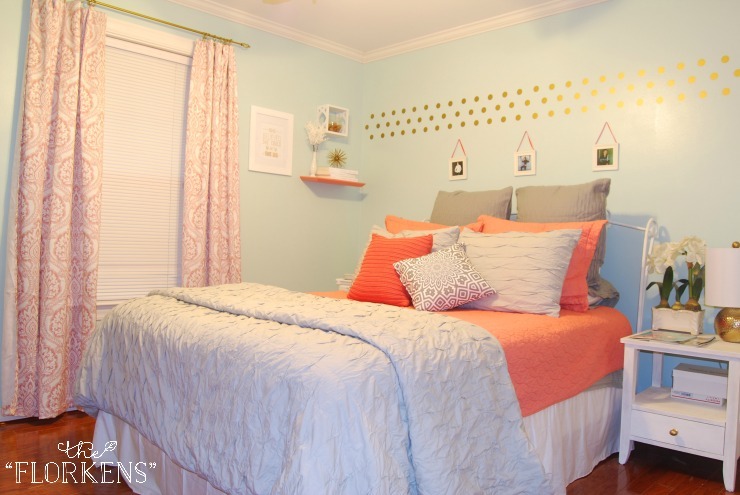 I really like those gold dots on the wall - it makes it look so much roomier! It looks fantastic!!! I love the colors!!! It looks so cheerful and bright! Great job!! Looks amazng! Love the colors you picked out! Opens the room right up! It looks fantastic. You did so well with the colour scheme. I really struggle when it comes to using colour in my home decor. I always stick to neutral shades. I can only dream of being able to come up with something like this! Swoon. It looks FANTASTIC, friend(s)!! Please come over and decorate my entire apartment. I am USELESS when it comes to this stuff. I LOVE how bright it is now!!! Love the guys bedroom! Way better than before!